It was Valentine's Day this week, an excuse to go out for a nice meal and overindulge. WH and I attempted to do just that, but ended up having a less-than-stellar meal at a certain celebrity chef's D.C. eatery that shall remain nameless. The service was exceedingly slow, the food too salty, and overall it was just generally a mediocre meal. We could have let that put a damper on our evening, but instead we let it lead us down memory lane. We reminisced about various memorable meals. For instance, we talked about amazing dim sum we had in London, eating at the top of the Dancing Building in Prague, three feet of sausage in Germany, dinner at Central the night we were married, our first anniversary at Les Halles (Anthony Bourdain's restaurant) in New York, and on and on. There were so many wonderful meals, it was no big deal that this year's Valentine's dinner was a bust. Of course, not every meal was amazing. We also remembered dining with a friend who declared his meal disgusting and insisted the waiter remove it from his sight. Or there was the time we were on our honeymoon in St. John and I ordered a pasta and seafood dish. When it came to the table, it was so laden with salt that it was inedible. I cannot stress enough that I almost never send food back, but this dish was so bad that I had to tell the waitress. She took it back to the kitchen and then came back to give me a message from the chef. According to the waitress (or the chef, whichever), some people (read: me) are not used to "fine cheese" which can make some dishes a little saltier than usual. As someone who never met a cheese she didn't like, I was pretty sure it wasn't the cheese that ruined the dish, but the 14 tablespoons of salt that had been added to it. 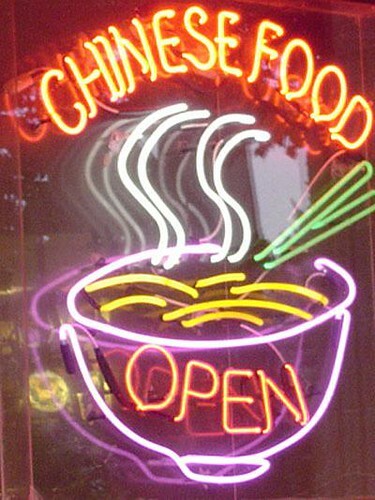 But the absolute best worst meal we ever had was in Chinatown in San Francisco. It was the first trip we had taken together and we were looking forward to enjoying some really good Chinese food. We had a recommendation for a restaurant that was supposed to be the best in Chinatown. After wandering the streets for about 20 minutes, we gave up and figured, what the hell . . . we're in Chinatown in San Francisco, it's probably all good Chinese. Little did we know. The dumplings arrived and were served with -- wait for it -- A-1 mixed with soy sauce. It was straight downhill from there. We ate what we could stomach and quickly paid the check. As we were leaving, a little cat was pacing on the sidwalk in front of the restaurant. WH, always devilish, opened the door for me on the way out and held it open maybe a smidge too long. Just long enough for the cat to run into the restaurant and across the dining room. We watched as the diners gave the cat the side-eye and the waiters looked alarmed. I'm sure the cat and the terrible food did nothing to dispell the old myth about Chinese restaurants . . . but it was hilarious to us! Plus, it just goes to show, that no matter how bad the meal, with the right dining companion, any meal can be memorable! What memorable meals have you had dining out? Our friends the Gay Lawyer (more on him here and here) and his partner the Gay Historian recently adopted -- after having to wait for way too many years -- what is, without any doubt or argument, the cutest baby boy on the planet. I know this because as his surrogate aunt, I feel what I can only imagine is what those in the business call "maternal" when I see him. And I don't even really like babies all that much (need I remind you of this?). Though this is no ordinary baby . . . but I digress. Last weekend, after spending some time with my Darling Nephew, it occurred to me that when people talk about babies and what they want to do to them, the talk is often actually quite gruesome. My exposure to babies is fairly limited, so it may just be that the cutest baby in the world induces this kind of behavior in otherwise sane adults, but somehow I suspect that all babies induce hysteria in someone. When I was talking with some friends who have also fallen under the spell of my favorite infant, the comments ranged from [tame] "I want to put his whole foot in my mouth," to [creepy] "I could just squeeze him to death," to [grotesque] "I want to eat him alive." Much as I love the kid, I'm not sure I could resort to baby cannibalism. This got me thinking . . . what is it about babies that make regularly sane people go batshit crazy? Their little tiny hands and toes are cute, who can argue with that? There's that soft little baby skin, people spend their entire adulthoods trying to re-achieve that. And that punch-drunk way that their heads are too big for their bodies, what's not to like about that? But when do we make the leap from toes, skin, and heads to the desire to squeeze, pinch, and devour a tiny human? I don't get it. 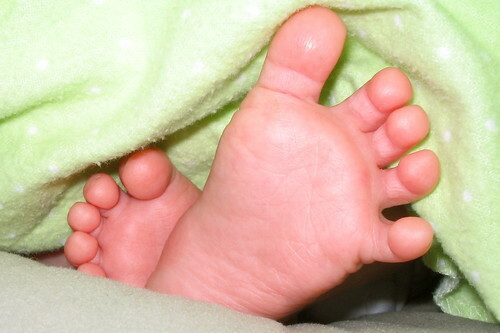 Then again, those little bitty toes do look kind of like corn nibblets.